Every one of your pictures tells a story. Tell them with the beautiful hand-crafted metal on our hippo-tastic magnet frames! 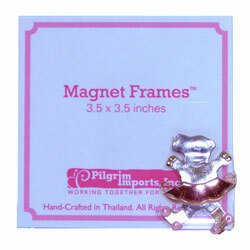 The frame with magnetic backing is made of one folded piece of clear acrylic in which a small photo may be inserted. A non-removable metal embellishment is attached to the front of the frame. Approximately 3 1/2" x 3 1/2". Beads: Pilgrim uses different styles, colors, and sizes of beads. The beads are always well attached to our products so that they do not fall off, but you should still take care with young children.